A few months back my mom came to visit with this large glass apothecary-esque jar in tow. “I figured you could use it for something,” she said. “Maybe a terrarium?” Brilliant. It was perfect for a terrarium to bring a little green to my new office at work, which happens to have a large, sunny (and empty) window ledge. Last weekend when picking up a few extra vegetables and plants for my actual garden, I finally got around to getting the goods for my terrarium. Instead of the moisture-loving plants found in many terrariums, I went with charming succulents to create a quirky, low maintenance cactus terrarium. This is a pretty foolproof project even if you’re not the gardening type. The hardest part of the whole project was editing my plant selection! I ended up with two neon colored cactus, an aloe plant, a mini jade, two sempervivum and a frilly ground cover succulent – which I’m happy to report are thriving so far. *NOTE: These are rough instructions. 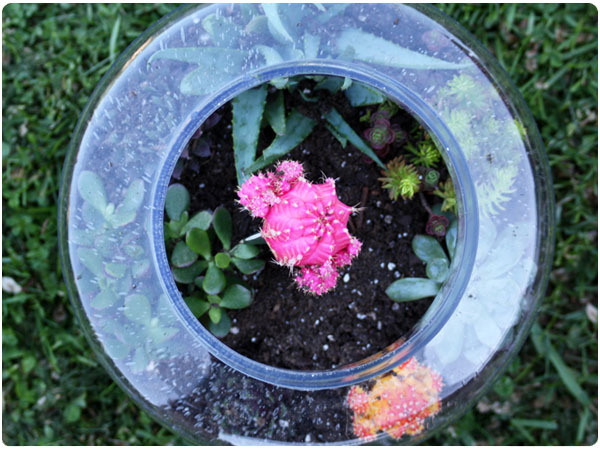 Depending on the size and shape of your terrarium container, you may not need all three “soil” items or you may need to adjust things to fit in a smaller container. 1. Line the bottom of the container with a thin layer of charcoal. 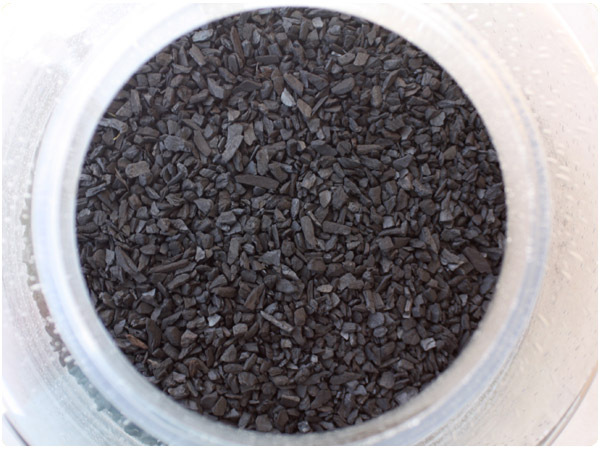 This helps with drainage and with preventing potential odors in your terrarium. 2. Next, line with a thin layer of river rocks. 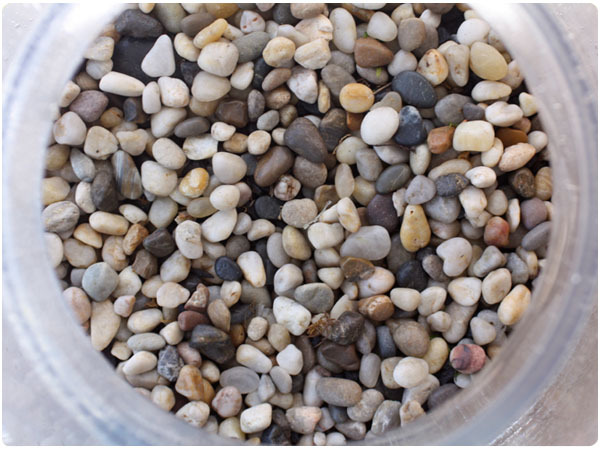 In a smaller container you could reverse the layers of soil and rocks for a more “zen garden” look. 3. Depending on the size and shape of your container you may be able to put the cactus soil in first or the succulents, filling in the soil around them. I had to put the plants in and use a spoon to fill soil around the plants in order to fit them. Place plants as desired to mix up shapes and colors. 4. Finish off with soil or with additional rocks to achieve the look you want. 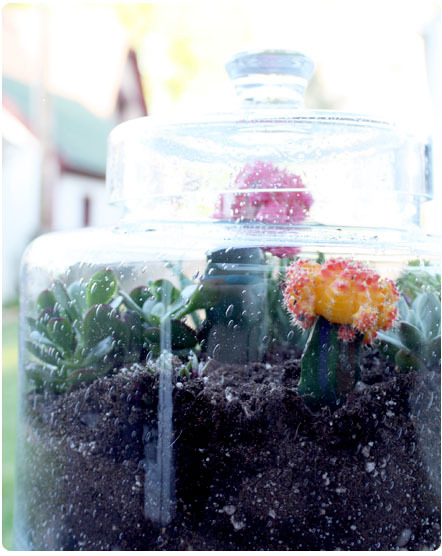 Care: Your succulent terrarium needs lots of sunlight but only needs to be lightly watered about once a week. If you choose to keep a lid on it, water less frequently as the plants will generate moisture. What a beautiful way to spruce up the office! Thanks so much for the directions! I made my sister a terrarium similar to yours for her birthday and it turned out fantastic!